Listerine Foot Soak - Everything You Need To Know? Feet are the one part of our bodies that seem to get neglected, yet they often need the most care. But looking after our feet doesn’t have to be a chore. For a few minutes each day you can pamper your feet with a Listerine home-made foot soak that will provide many healing properties for the myriad health issues that can trouble your feet. Feet can be prone to callouses, warts, fungus, and dry skin. It seems like the more time you spend on your feet each day, the worst they look. Most people want to look their best for the summer months when they wear shorts and sandals, so the sooner you collect your foot soak ingredients together, the sooner your feet will look soft and smooth. In this article we will be talking in detail on how listerine foot soak helps you in achieving healthy foot. A good foot soak will make you feel a bit pampered, it will make you feel relaxed. They can do wonders like soothing your muscles, hydrating your skin and relief from pains that happens due to standing for hours or walking in new shoes. They are also found to reduce swelling of foot and preventing bacteria from getting into cuts and cracks beneath toe nails. However, there are some additives you can make use of to improve the effects of foot soaking. Some of these additives include vinegar, epsom salt and other essential oils. Why Choose Listerine as a Foot Soak? Lately, you may have been surprised to hear that Listerine is a recommended main ingredient for a good foot soak that can slough off dead skin and calluses. Listerine is actually a mouthwash that aids in freshening breath and killing harmful bacteria in your mouth, so it may puzzle many as to why they’d apply it to their feet. Listerine is not only inexpensive, but it’s simply to use, and has many beneficial ingredients that can aid in the care of the feet and entire body. Now that you have a brief idea about what listerine is. Let’s learn how their wide range of properties are used to improve the health of our foot. How Does Listerine Help Your Feet? Just like Listerine can make your mouth feel fresh, it will also provide a soothing feeling to your feet. Listerine contains a variety of natural and man-made chemicals that aid in your health. Listerine contains active ingredients—ingredients that pharmaceutically can influence your health—such as essential oils. These oils may include menthol, thymol, methyl salicylate, and eucalyptol. All of these essential oils have known antiseptic and anti-inflammatory properties. Did you know : Women have about four times as many foot problems as men. Listerine also has inactive ingredients such as water and a colourant. 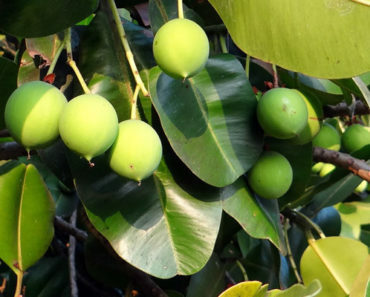 It also contains an alcohol—ethanol—which is also known for its disinfecting properties. Ethanol serves to allow the essential oils a chance to dissolve and be held together within the bottle so that the oils don’t separate, much like alcohol is used in perfumery to hold the essential oils together to create one scent. When feet are soaked in the Listerine foot soak, feet will become softer as the ingredients penetrate the epidermis of the skin, which is mostly dead tissue. You’ll probably want to use a loofa or a cloth to rub your feet clean after your foot soak, particularly focussing around callouses and hardened heels. You’ll notice that your feet will remain feeling soft and supple for several days afterwards. Since Listerine has antiseptic properties, it’s also great for eradicating toenail fungus and athlete’s feet too. Making Listerine foot soak is fast and easy, but you’ll need to spend time relaxing, to gain its beneficial properties. 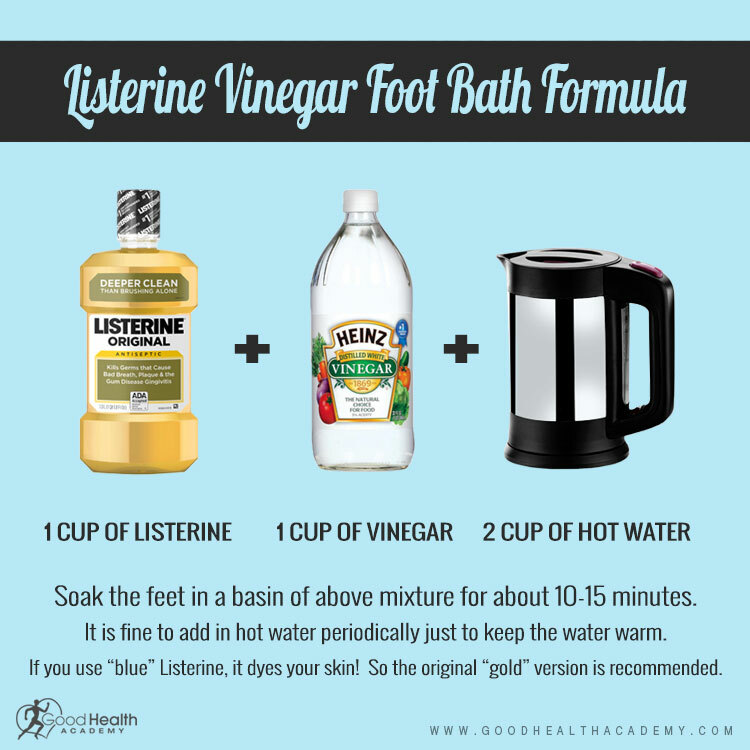 Begin with the basic Listerine foot soak recipe. Later, you can try some of the other beneficial recipes to aid with other foot care issues. You only need two ingredients and a plastic tub to make this recipe. 1 plastic tub that is big enough for your feet and tall enough for you to immerse your feet in water without overflowing. 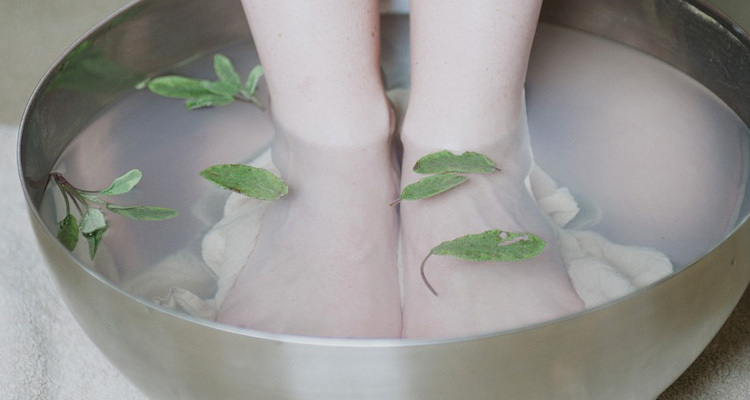 Use these simple steps to gain the full benefits from your foot soak. Pour all ingredients into the plastic tub. Place feet in your tub. Sit for thirty minutes, but ideally for one hour. Add more warm water to the tub if you want. Use a loofa to scrub your feet. Dead skin should slough off. Rinse your feet in warm water. Dry feet with a towel. Continue on with your day. If you have a lot of dry dead skin on the underside of your toes or heels, you may need to try a different type of foot soak. You’ll need to add one additional ingredient to your foot bath soak. Have you ever eaten vinegar and chips, and then later experienced dead skin coming off the inside of your cheeks and your tongue? You can also use vinegar on your feet for this same purpose. Collect together the following ingredients. Follow these simple steps to gain smooth, soft feet. Pour all liquid ingredients into the plastic tub. Place feet in tub and relax. Wait for a period of half an hour to one hour. Add more warm water if you wish. Remove feet and use a loofa to get rid of dead skin. 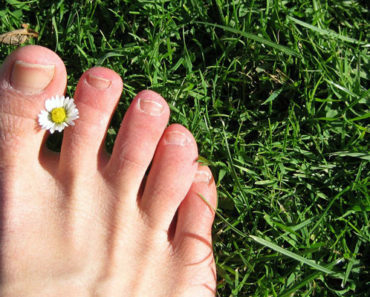 Toenail fungus not only looks unsightly, it can be embarrassing as well. Men may particularly find it a challenge, as they can’t hide it with dark nail polish like women can. But prescription medications can be expensive for getting rid of toenail fungus. Try this affordable Listerine foot soak for nail fungus. You’ll need to be patient, as it takes time for your old nails to grow out. New growth will resemble natural, normal nails. You’ll a few stronger ingredients for this method. Small plastic bowl—enough to comfortably place your toes in, but to keep the rest of your feet out. Follow these steps to help get rid of unsightly toenail fungus. Pour liquid ingredients into the plastic bowl. Stick only your toes into the bowl. Ensure that your toenails are covered. Soak your toes for thirty minutes. Do not rinse off feet. Athlete’s foot is actually a fungus that grows on the bottom of the feet. It can make feet extremely itchy, and is contagious. Feet can also become swollen and sore over time with unsightly skin peeling, particularly if it’s not properly treated. Most people who get this condition want to stop it immediately. Listerine also works as an effective treatment for athlete’s foot. Collect together the following ingredients for your athlete’s foot soak. It’s best to completely cover your feet in your Listerine foot soak, as you’ll never know which parts of your feet may be infected. Place all ingredients in your plastic tub. Soak feet for thirty minutes to one hour. Add hot water if you don’t like the water cooling down. When done, remove feet and pat dry. Repeat treatment twice a day until you experience relief. Don’t assume that Athlete’s Foot won’t come back—continue treatments once a month, or as required. Listerine has many other beneficial uses. And since you already know what the ingredients are, you won’t have that worry about harmful ingredients or high expense from a written prescription. Try using Listerine for many other beauty and health issues. Use Listerine as a deodorant. Dab on with a cotton ball. Use it as an aftershave lotion to prevent bumps and infection. Use it to disinfect new body piercings. Massage it into your scalp to help you to get rid of dandruff. Use it to treat poison ivy or poison oak skin exposure. Dab it onto skin allergies such as hives, to lessen itching, and decrease inflammation. Apply it to insect, bee, and wasp stings to help relieve pain. Apply it to blisters to help them heal, and to prevent infection. Soak your toothbrush once a month in a small cap of Listerine in order to sterilize it. Pour a small amount of Listerine into the water of your humidifier in order to prevent the growth of mildew or bacteria. Pour 1/2 cup of Listerine into the water tank of your toilet and then flush. This will help to get rid of germs and odour, making your bathroom smell fresh. Use Listerine to rub down faucets, door handles, light switches, and other regions of the bathroom or kitchen that are often touched by many hands. This will help to prevent the spread of colds or viruses, particularly in the winter. A Listerine foot soak will provide a soothing and healing treatment for many foot conditions, and you’ll also find that it has nearly limitless uses for many other skin care and health conditions. You’ll want to buy two bottles of Listerine—one for your mouth and one for your body—as you discover many more beneficial uses for this affordable product. If you have bruises or cuts in feet, then it is always recommended to consult a physician before opting for foot soak procedure. It is not recommended for diabetic patients to follow this foot soak procedure, as their problems on feet can be due to other reasons, so the best bet will be to rely on a doctor for treatment. These are the opinions and suggestions of people who used it already, but only you knows what works better for you. Listerine products are easy to find compared to others, they are readily available on medical stores or in online stores. Earlier there was a time, when Listerine products were not present in abundance on many of those stores. But now their ever growing popularity due to the wide range of applications they offer, they have become a common product in many of these stores. Over the years, applications of listerine grew in number and has earned a name of being a wonder product capable of doing a lot of benefits to health! It is their anti-fungal and antibacterial properties that makes them a strong remedial treatment for getting rid of dry dead skin. Hence foot soaks involving listerine is found to bring good results if followed routinely over a period of time. Likewise, they are also effective in dealing issues related to skin and hair(getting rid of lice). And if it works, it could well become a life saver. Moreover, they are not expensive to give it a try. How is your experience performing Listerine foot soak? Did they really worked for you? Or do you know any other effective remedial measures for treating issues related with feet, that you would like to share with us. If so do let us know, we would like to know your feedback and suggestions. Thank you very much for the information. I’ve used a foot scrub made from blue Listerine and Sea salt. You should definitely give it a try, if u haven’t already!! It feels great and the room smells good too. My mother used Listerine for dandruff and I loved it for lice control. Not heard that you can use for lice before, and how do you apply it?